Since incorporating facial oils into my nightly skin care routine, I have been enjoying the best skin ever. My breakouts have lessened and my pores seem smaller. As someone with oily skin, I read years ago that using oil on oily skin helps control it. They were totally right. I used to use products that were geared towards being oil free, but they were so drying and my skin produced more oil as a result. I’ll tell anyone with any skin type that adding an oil will be a tremendous benefit to their skin care routine. 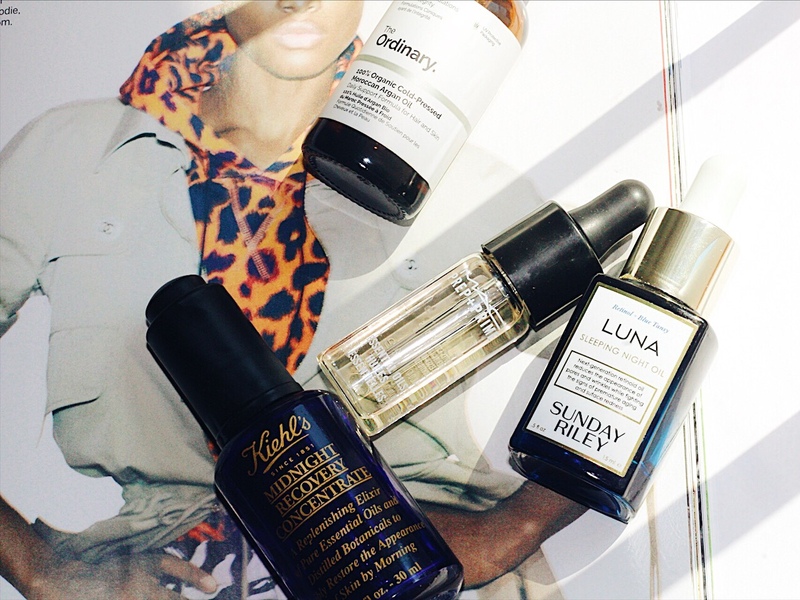 Some of my absolute favorites are the Kiehl’s Midnight Recovery Concentrate. It is so light, texture-wise, but it packs a punch in the way it provides hydration and you literally wake up with the most gorgeous skin. With a combination of Evening Primrose and Lavender Oils, my skin glowed like a new born baby. This is an oil that I will always have on my bathroom counter because it works. In addition to the Kiehl’s oil, the Sunday Riley Luna Sleeping Night Oil is in heavy rotation in my night time skin care routine. Because of this is a retinol based oil, it truly helped brighten my skin when it started to look dull and evened out my skin tone. Any dermatologist will tell you that most people should incorporate a retinol in their skin care routine. If you are considering that, I would point you to the Luna Oil. I love it. The only downside is that it is quite greasy and not as dry as the Kiehl’s, but it works and just a drop or two is enough to do the job. Another favorite of mines is The Ordinary 100% Organic Cold-Pressed Moroccan Argan Oil. This super budget friendly oil rocks! When I’m not using my other oils, I always grab this. I layer it over The Ordinary Lactic Acid 10% + HA and I wake up with super glory skin! I don’t necessarily use the MAC Prep + Prime Yuzu Oil as a night treatment, but I love this because it’s an oil you can mix with your makeup for added hydration and when you want dewy skin. I use a drop in my foundation sometimes during cooler months and it helps my skin not get dehydrated. It’s also a quick way to dab on the top of your cheekbones for a natural highlight! Would you consider using facial oils? If you have already, which ones do you like best? Would love to hear your thoughts!